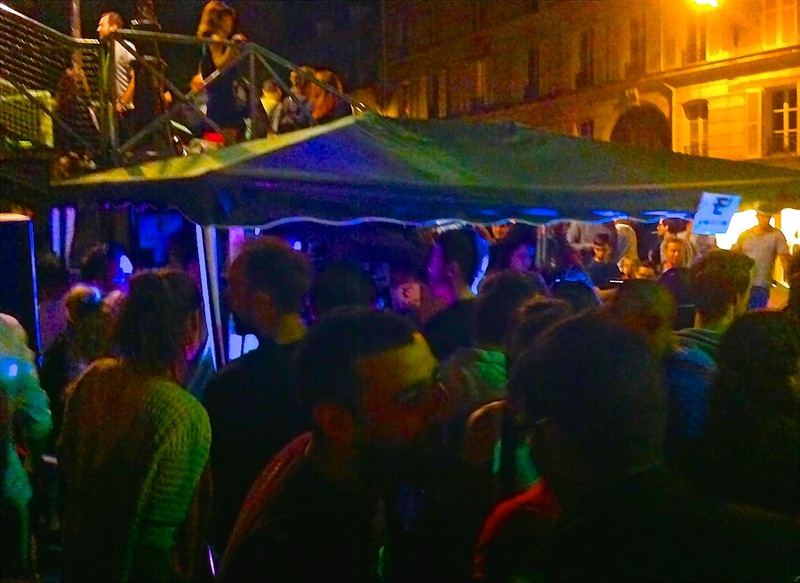 Last weekend, as I wrote about earlier, was la Fête de la Musique in Paris. It’s actually a world-wide festival, but the French are pretty hard-core about it. There are thousands of free music events across France and hundreds in Paris alone. I had never been, but it was recommended by a good friend of mine, so we decided to give it a go. The weather cooperated nicely. In fact, it was absolutely perfect… sunny, warm, gorgeous spring/summer weather just in time for the longest day of the year. Most of the events take place in the evening but there is plenty going on during the day. There are roaming street performances throughout the city. We saw 2 bands playing in Parc Monceau while we were out for a morning run (I didn't have my camera for obvious reasons), and then on our next lap around they had already moved on. In the afternoon we wandered the city. We found a group of tango dancers at Arts et Métiers and and then some salsa dancers at at République. After checking out their skills for a while we headed to Hôpital Saint-Louis where there was a band playing in the courtyard. The music wasn't quite our style there, but we did find a lovely, quiet, and open-to-the-public park hidden in the center of the hospital that could be great for a quite escape from the busy streets. Next we headed of the the Canal Saint-Martin area, a very popular Parisian hang out on beautiful days like this. We were just in time to find a few DJ's setting up for the night. This was a great place to park ourselves for the evening. Lots of people had packed bottles of wine and other refreshments, and were enjoying themselves around the canal. And if the DJ wasn't your thing, a couple bars in the immediate area had bands playing. As the sun went down things definitely started to get pumped up, and the streets got more and more crowded. I really enjoyed myself. I just love a good street festival. It's especially fun when you don't really know what to expect. I had heard it was a day of street musicians, so I was expecting a bunch or brass and jazz bands in the street.. and yes, there was that. But what I wasn't expecting was the full out party! If you are ever in paris on the first day of summer, I would definitely check it out. Looks like you've had a really good time! Thank you for sharing this great event with us! Looks like a lot of fun!! I miss Paris so much..